PENDANTS MAY BE PURCHASED SEPARATELY! Do you want a cool necklace that no one else has? Have fun and design your own! You choose the pendant, cord color and bead color and we'll put it together for you. What a great idea for an individualized gift! Comes with a 20" cord necklace with a lobster clasp closure. If you would like a different length for the cord necklace, please email us. We don't mind adjusting the length and there is no extra charge for this service. Pendants are imported. All pendant necklace come with one pendant. If you wish to place a CUSTOM ORDER with additional pendants and/or beads, please contact us before ordering. Necklaces are made here by the artist. Individually priced. If you see a pendant you would like to order as a necklace but it is not offered with the cord color you would like, just email us and we can make it with any color cord you would like. Great for parties or crafting. We can make up a Party Package for you, including everything you would need to make a necklace. Contact us for details! The US Quarter at the end of Row 3 can be used as a guide to approximate the size of each pendant. 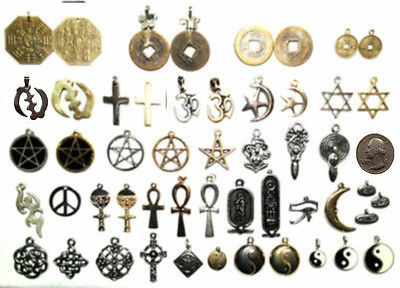 PHOTO #1 shows all of the pendants available. Row 3 - Pentagram - Black Inlayed Pendant/Pewter and Brass, Pentagram - Cut Out Pendant/Pewter and Brass, Star Pendant/Brass. The US Quarter can be used as a guide to approximate the size of each pendant. 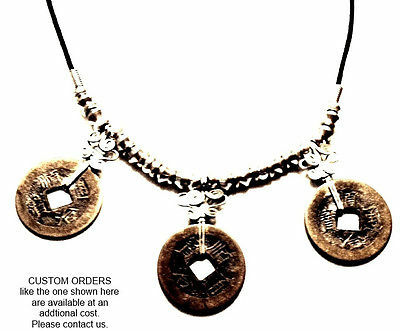 The top necklace is made with a pewter Aku Aba Fertility Goddess Pendant with steel beads on brown cord. The middle necklace is made with a brass Om Pendant with brass beads on navy cord. 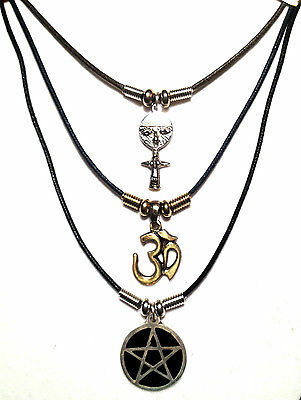 The bottom necklace is made with a pewter Pentagram - Black Inlayed Pendant with steel beads on black cord. PHOTO #3 shows an example of a CUSTOM ORDER necklace using three Wire Wrapped Alchemist Coins separated by various metal beads that add interest to this piece. Custom order necklaces are available at an additional cost. Please contact us if you are interested in having us create a custom piece for you. We will provide pictures of the finished necklace before you place your order so you can see how it looks and make any changes you would like.